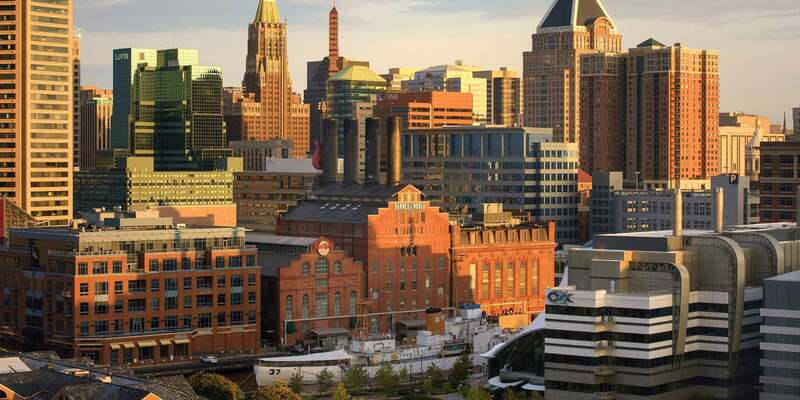 Last week, the International District Energy Association (IDEA) hosted a conference in Baltimore, MD. on the innovations and solutions that drive sustainable energy infrastructure on campuses. Both Pam Clark and Mat Ware of Veolia presented throughout the week on the strong partnership between Baltimore and Veolia. As part of the presentations, Veolia hosted tours of Baltimore’s Plant 1 facility, which provides chilled water to more than 12 million square feet of space across the city and over 50 major customers. The infrastructure upgrade was a project that came to fruition because of close collaboration between Veolia, the City of Baltimore, the Baltimore Convention Center and the Maryland Stadium Authority. Baltimore’s Plant 1 is home to one of the largest ice thermal storage systems in the country. “I think the question we got asked the most was about the ice storage,” Pam says. The system produces ice at night to augment electrical chilling capacity during the day which takes pressure off of the electrical grid during high-demand hours. This allows us to partake in demand response, offers redundancy, and additional reliability. Not only does ice storage help reduce the amount of electricity generated during high demand hours, but it also uses less space than traditional chilled water storage. Looking for more sustainable solutions, some campuses are considering expanding to implement ice storage to improve electric rates, peaking, redundancy and more. States are interested in this technology, too. Maryland, for example, is offering up to $75,000 in rebates for thermal storage, particularly ice. CampusEnergy attendees who took a tour of Plant 1 saw one of Veolia’s innovative tracking software tools. The technology presented, “Termis,” allows for live tracking of water temperature, velocity and flow at various points of your system. “There’s a lot of interest in seeing your system in real time and seeing how it reacts to changes — whether it be turning the plant on and off, or understanding in real time how your system is reacting,” Pam says. Plant 1 also uses Termis for various test scenarios. “Let’s say we’re going to have an outage on this piece of pipe,” Pam explains. “We’re going to shut Valve X and Valve Y, and see how that impacts the rest of the system and make sure that all of our customers get the chilled water that they need.” Instead of modeling just a selection of piping, Plant 1 is able to monitor its entire system dynamic to get the best analysis possible. With help from the latest systems and technology, operators at Plant 1 are able to efficiently manage chilled water production and distribution, resulting in reliability for customers. Missed the tour during CampusEnergy? Watch the video on Plant 1!